IndieAn is stepping up their promotion of side-scrolling shooter Heavy Mach with the release of a free Lite version [App Store] as well as a price drop from $2.99 to $0.99 on the full version [App Store]. The best aspect of the game is the number of powerup weapons and upgrades you can get for your tank. 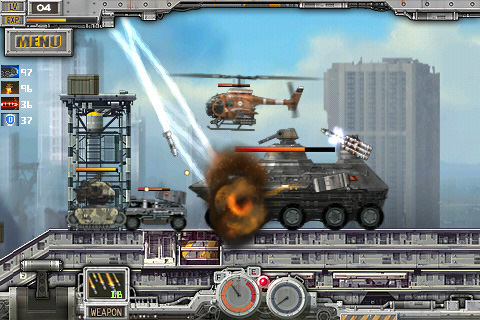 Powerful weapons upgrades include a machine gun, shotgun, howitzer (high-angle gun), missile, laser, nuclear bomb and more. You have to be judicious about your use of these weapons, however, as you only get a limited supply of each as you go on. I found it worked much better to reserve these weapons for “boss” enemies rather than waste them on the minor players. A version update has addressed a few of the 1.0 issues including an originally non-functional Menu button. Edit: Menu button still non-functional in Full version, works in Lite version. This gameplay video shows almost the entirety of level 6 (Mission 2, Stage 2).